For parties, picnics or brunch! One of my favorite dishes ever, tortilla española, is picnic and party portable, light yet filling, subtle yet hearty and includes just four basic ingredients (plus salt). It also looks beautiful in a sturdy, wholesome farmhouse way. I eat it warm or cold, for breakfast, lunch, dinner or brunch (or a midnight raid on the fridge). 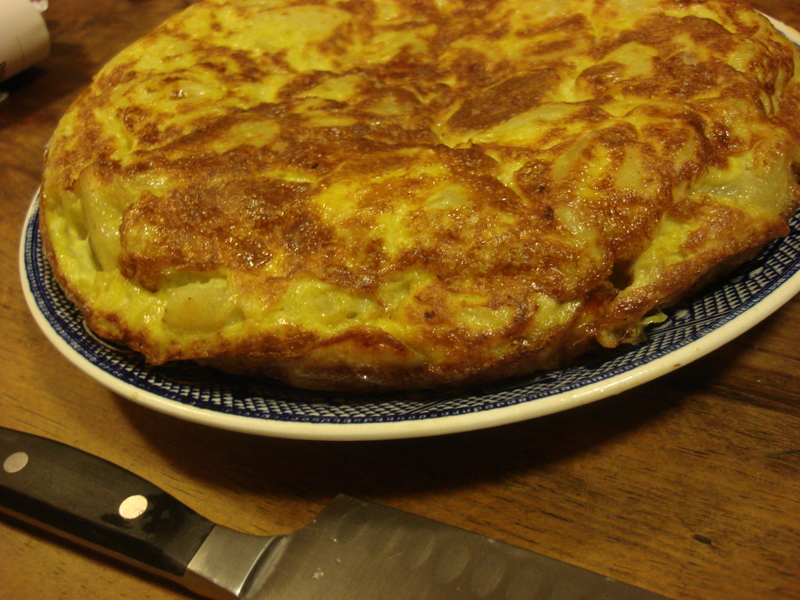 It keeps — refrigerated – for a couple of days, but honestly, tortilla española never lasts that long in my house! Spanish people (from the Iberian peninsula) are quite — and rightly — proud of their culinary traditions. Serving your home-made tortilla to a Spaniard is kind of like serving your spaghetti marinara to an Italian from Italy: there is a good chance you will be damned with faint praise, or met with an unsuccessfully concealed sniff of a European nose that tells you you just don’t get it. But I have served my tortilla to Spaniard after Spaniard and the invariable response has been a request for seconds and a lot of praise, so I think it’s a winner. ¡Olé! This is a pretty easy dish, but does require some derring-do for the flipping (unless Rosaria turns up with her fancy tortilla flipper one day soon!). I am including a list of equipment here so that you can set yourself up for success without scrambling for stuff. Thanks to Ashley for chopping and for writing down the exact proportions while I measured and stirred. Heat oil until liquid and fragrant and layer potatoes and onions in the oil. Lower heat to medium and cook vegetables until tender (if they start to brown, lower the heat more), turn occasionally. Open bottle of prosecco or other refreshing white wine and begin drinking (This is Ashley’s contribution to the recipe). In a large bowl, gently beat eggs. When vegetables are tender, drain into colander, reserving oil. Put drained vegetables in egg mixture and stir to cover, adding 1/4-1/2 tsp salt. Allow to rest for five to ten minutes. Clean pan and heat a small amount of the reserved oil into pan (non-stick pans should require little more than a rub of oil) at medium-high. Save reserved oil for another dish. Pour egg mixture into pan and allow to cook at medium high until a crust forms on the art of mixture that is in direct contact with the pan. Cover and lower heat to medium low, shaking occasionally. When mixture is relatively firm CAREFULLY lay plate face down on pan and turn tortilla onto pan (this is where liquid can come out; I do it over the sink). Slide tortilla back into pan, uncooked side down. Continue cooking until it slides easily in pan. You may flip a few more times to improve shape, then flip onto plate, allow to cool for at least ten minutes, slice pie-style and serve with salad or cut into squares for a buffet or appetizer (stick with toothpicks for hors d’oeuvres). Isn’t it funny…there are as many tortilla recipes as there are cooks who make them! Thanks for the visit and the thoughtful comments!